This guide describes how to use the JBoss Server Migration Tool to migrate your application server configuration from a previous release of JBoss EAP to JBoss EAP 7.1. Red Hat JBoss Enterprise Application Platform 7 (JBoss EAP) is a middleware platform built on open standards and compliant with the Java Enterprise Edition 7 specification. JBoss EAP provides two operating modes for server instances. The standalone server operating mode represents running JBoss EAP as a single server instance. The managed domain operating mode allows for the management of multiple JBoss EAP instances from a single control point. JBoss EAP includes APIs and development frameworks for quickly developing secure and scalable Java EE applications. Many of the APIs and capabilities that are exposed to applications deployed to JBoss EAP servers are organized into subsystems that are configured in the server configuration files. For example, you configure database access information in the datasources subsystem so that it can be accessed by applications deployed to JBoss EAP standalone servers or managed domains. The introduction of new features and deprecation of other features can require modification of the server configurations from one release of JBoss EAP to another. For more information about Red Hat JBoss Enterprise Application Platform, see the Product Documentation for JBoss EAP located on the Red Hat Customer Portal. Migrating an existing application server configuration from one release to another is a complex task. To plan and execute a successful migration not only requires a complete understanding the current server configuration, but also knowledge of features and changes in the target server configuration. With a manual migration, you generally copy and edit several configuration files, and then make the updates needed to keep the same behavior in the new release. If this is not done correctly, the new server does not work as expected. This is often because some functionality is not supported by the new server. The JBoss Server Migration Tool is a Java application that automatically migrates JBoss EAP server configurations with minimal or no interaction required. It is the preferred method to update your JBoss EAP server configuration to include the new features and settings in JBoss EAP 7 while keeping your existing configuration. The JBoss Server Migration Tool reads your existing source server configuration files and adds configurations for any new subsystems, updates the existing subsystem configurations with new features, and removes any obsolete subsystem configurations. The JBoss Server Migration Tool supports the migration of standalone servers and managed domains for the following configurations. The JBoss Server Migration Tool ships with JBoss EAP 7.1, so there is no separate download or installation required. You run the tool by executing the jboss-server-migration script located in the EAP_HOME/bin directory. For more information about how to run the tool, see Running the JBoss Server Migration Tool in JBoss EAP 7.1. It is recommended that you use this version of the JBoss Server Migration Tool to migrate your server configuration to JBoss EAP 7.1 as this version of the tool is supported. For migration to JBoss EAP 7.0, you must download the latest binary distribution of the JBoss Server Migration Tool from the wildfly-server-migration GitHub repository. This open source, standalone version of the tool also supports migrating from several versions of the WildFly server to JBoss EAP. For information about how to install and run this version of the tool, see the JBoss Server Migration Tool User Guide. The binary distribution of the JBoss Server Migration Tool is not supported. Rather than use this version to migrate your server configuration to JBoss EAP 7.0, it is recommended that you use the supported version of the tool to migrate your server configuration directly to JBoss EAP 7.1 instead. In this document, the variable EAP_HOME is used to denote the path to the target server installation. Replace this variable with the actual path to your server installation. EAP_HOME is a replaceable variable, not an environment variable. JBOSS_HOME is the environment variable used in scripts. If you installed JBoss EAP using the ZIP install method, the install directory is the jboss-eap-7.1 directory where you extracted the ZIP archive. If you installed JBoss EAP using the RPM install method, the install directory is /opt/rh/eap7/root/usr/share/wildfly/. Before you migrate your current source server configuration, be sure to apply the most recent patches and updates that are available for that version of the JBoss EAP software. For information about how to upgrade your server configuration, see the Patching and Upgrading Guide for JBoss EAP. Because the JBoss Server Migration Tool creates the configuration files based on the configuration of a previous release, it is intended to be run on a clean and unconfigured target server installation. The JBoss Server Migration Tool creates a backup of the target server’s configuration files by appending .beforeMigration to the file names. It then creates totally new configuration files for the target server using the source server’s configuration files, and migrates the configuration to run in target server configuration. When you run the JBoss Server Migration Tool, all changes on the target server made between installation and running the migrate tool are lost. Also, be aware that if you run the tool against the target server directory more than once, the subsequent runs will overwrite the original target configuration files that were backed up on the first run of the tool. This is because each run of the tool backs up the configuration files by appending .beforeMigration, resulting in the loss of any existing backed up configuration files. The JBoss Server Migration Tool provides the ability to configure logging, reporting, and the execution of migration tasks. By default, when you run the JBoss Server Migration Tool in non-interactive mode, it migrates the entire server configuration. You can configure the JBoss Server Migration Tool to customize logging and reporting output. You can also configure it to skip any part of the configuration that you do not want to migrate. For instructions on how to configure properties to control the migration process, see Configuring the JBoss Server Migration Tool. You can run the JBoss Server Migration Tool in either of the following ways. Interactive mode: This mode, which is the default, allows you to choose exactly which configurations you want to migrate. Non-interactive mode: This mode allows you to run the tool without prompts. You must stop both the source and the target JBoss EAP servers before you run the JBoss Server Migration Tool. By default, the JBoss Server Migration Tool runs interactively. This mode allows you to choose exactly which server configurations you want to migrate. Interactive mode does not allow you to choose which subsystems to migrate. For information on how to configure the tool at the subsystem or task level, see Configure the Migration Tasks Performed by the JBoss Server Migration Tool. The following are the basic steps that are performed for a minimal migration. If the server from which you are migrating includes custom configurations, for example deployments, or if it is missing default resources, the tool provides additional prompts. To run the tool in interactive mode, navigate to the target server installation directory and run the following command, providing the source argument as the path to the source server installation. You are prompted to determine if you want to migrate the source server’s standalone configurations, which are located in the EAP_PREVIOUS_HOME/standalone/configuration/ directory, to the target server’s standalone configurations, which are located in the EAP_HOME/standalone/configuration/ directory. Migrate the source's standalone server? If you respond with no, standalone server migration is skipped and no standalone server configuration files are migrated. If you respond with yes, you see the following prompt. Respond with yes to migrate all of the source server’s standalone server configuration files. Respond with no to receive a prompt for each individual standalone*.xml configuration file. Next, you are prompted to determine if you want to migrate the source server’s managed domain configurations, which are located in the EAP_PREVIOUS_HOME/domain/configuration/ directory, to the target server’s managed domain configurations, which are located in the EAP_HOME/domain/configuration/ directory. Migrate the source's managed domain? If you respond with no, managed domain migration is skipped and no managed domain configuration files are migrated. If you respond with yes, the tool begins migrating the managed domain content of the source server. A ciphered repository is used to store data, such as deployments and deployment overlays, that are referenced by the source server’s managed domain and host configurations. Because the source and target servers use a similar content repository, the tool simply copies the data from the source server to the target server and prints the results to the console and the server log. INFO  [ServerMigrationTask#398] Resource with path /__EAP_HOME__/domain/data/content/22/caa450a9ba3b84eaf5a15b6da418b92ce6c98e/content migrated. INFO  [ServerMigrationTask#399] Resource with path /__EAP_HOME__/domain/data/content/23/b62a37ba8a4830622bfcdb960280577cc6796e/content migrated. Next, the migration tool scans the source server for managed domain configuration files, prints the results to the console, and provides the following prompt. Respond with yes to migrate all of the source server’s managed domain configuration files. Respond with no to receive a prompt for each individual managed domain configuration file. Next, the migration tool scans the source server for host configurations files, prints the results to the console, and provides the following prompt. Respond with yes to migrate all of the source server’s host configuration files. Respond with no to receive a prompt for each individual host configuration file. Upon completion, you should see the following message in the server console. You can run the JBoss Server Migration Tool in non-interactive mode. This mode allows it to run without prompts. The JBoss Server Migration Tool automatically migrates all subsystem configurations for all server configuration files. For information on how to configure the tool at the subsystem or task level, see Configure the Migration Tasks Performed by the JBoss Server Migration Tool. To run the tool in non-interactive mode, navigate to the target server installation directory and run the following command, providing the source argument as the path to the source server installation and setting the --interactive or -i argument to false. By default, the tool automatically migrates all of the source server’s standalone and managed domain configuration files. However, you can configure the tool’s properties to skip migration of specific configurations. Upon completion, you should see the following message in the server console. When the migration is complete, review the migrated server configuration files in the EAP_HOME/standalone/configuration/ and EAP_HOME/domain/configuration/ directories. Note that any original EAP_HOME target server configuration file names selected for migration are backed up and are now appended with .beforeMigration. The EAP_HOME target server configuration file names not appended with .beforeMigration are now updated with the content migrated from the EAP_PREVIOUS_HOME source server configuration. The original configuration files located in the EAP_PREVIOUS_HOME source server configuration directories remain untouched. The logging.properties and standalone-load-balancer.xml files in the target configuration directories remain untouched. If you choose to migrate all of the available configurations, you should see the following configuration files in the target server directories. The JBoss Server Migration Tool begins each target server migration by executing a root task, which can then execute subtasks. Those subtasks can then also execute additional tasks and subtasks. As it executes, the tool tracks each migration task, along with any substasks, and saves the results in a tree structure that is later used to build the reports. Each migration task is given a name, which consists of a task name concatenated with optional attributes using the following syntax. The name defines the task subject or type, and the attributes are used to distinguish between subtasks and sibling tasks. For example, all of the following are names to distinguish ejb3 subsystem update tasks. Since a migration task can be executed multiple times under different parent tasks, each task is stored in the tree using each of its parent task names, starting with root, separated by a > character. The task execution tree is used to build the migration reports. A task execution can result in one of the following statuses. The task skipped the execution, either because it was not needed or because it was configured to be skipped. The Task Summary is generated and printed to the migration console and to the JBoss Server Migration Tool log file. It provides a high-level overview of the migration results, by component and subtask, as a hierarchical list. An example Task Summary report is located in the appendix of this guide. See Configuring the Task Summary for options to configure the resulting output. The JBoss Server Migration Tool generates nicely formatted HTML and XML reports in the EAP_HOME/migration/reports/ directory. These reports provide a detailed analysis of the migration process and how the target server was configured during the migration. The default names for these reports are migration-report.html and migration-report.xml. Each of these names is configurable. For information about how to configure the reports, see Configuring Reporting for JBoss Server Migration Tool. This section provides a brief overview of the content of these reports. 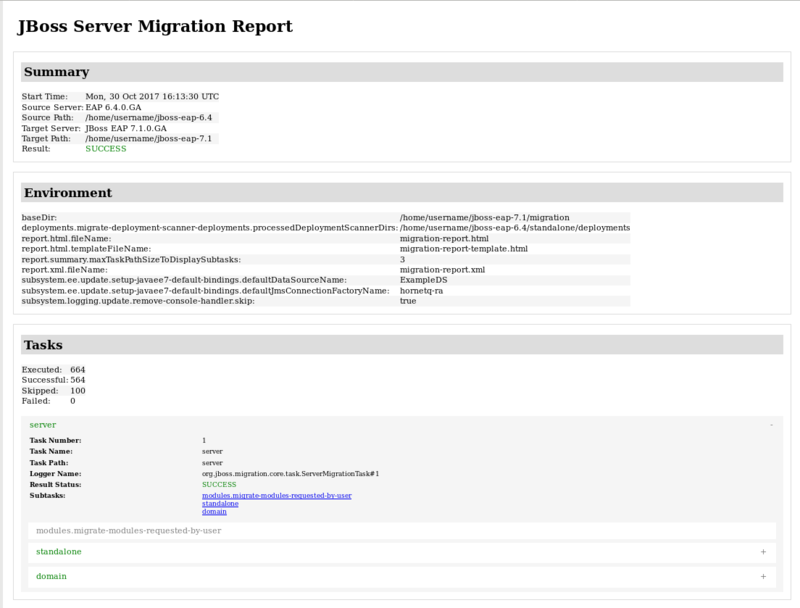 The JBoss Server Migration Report HTML file. The Server Migration Report XML file. The HTML report consists of three sections. This section provides the execution start time, information about the source and target servers, and the result of the migration. This section lists the environment properties that were used for the migration. Green if it was successful. Gray if it was skipped. An example HTML report is located in the appendix of this guide. See Configuring the HTML Report for options to configure the resulting output. The XML Report is a low level report that provides all of the migration data gathered by the tool. It is formatted in a way that it can be imported into and manipulated by third-party spreadsheet or other data manipulation tools. An example XML report is located in the appendix of this guide. See Configuring the XML Report for options to configure the resulting output. You use properties to configure the JBoss Server Migration Tool logging and reporting output and to determine which components and configurations you want to migrate. You can configure these properties using a combination of the following methods. You can configure the properties file defined within the tool. You can pass user properties on the command line. You can configure system environment variables. You can configure the JBoss Server Migration Tool using the environment.properties file located in the EAP_HOME/migration/configuration/ directory. This standard Java properties file provides the default values for all of the valid properties that can be configured when migrating to the target server. To change a default value, remove the # comment character that precedes the property and set it to the value you need. If you prefer, you can create a standard Java properties file that defines JBoss Server Migration Tool configuration properties and pass its path on the command line using the --environment or -e argument. This path can be an absolute path or a path relative to the current directory. Properties defined in files passed on the command line using the --environment or -e argument override the ones defined in the EAP_HOME/migration/configuration/environment.properties file. You can configure the JBoss Server Migration Tool by passing system properties on the command line using the following syntax. The system property name should be specified as jboss.server.migration. concatenated with the environment property name. The following example demonstrates how to specify the name of the XML report as migration-report.xml when starting the JBoss Server Migration Tool. Environment properties specified on the command line override both user configuration properties and tool configuration properties. Configuring the JBoss Server Migration Tool by passing system properties on the command line does not currently work for the following properties. This is a known issue that should be addressed in the next version of JBoss EAP. For more information about this issue, see JBEAP-12901. The JBoss Server Migration Tool uses the JBoss Logging framework to log the progress of the migration. Results are written to the console and also to a file named migration.log, which is located in the EAP_HOME/migration/logs/ directory. This log file is created if it does not already exist, and its content is overwritten on each subsequent execution of the tool. The logging configuration is provided by the EAP_HOME/migration/logging.properties file. You can modify this configuration file or you can specify an alternative logging configuration file by using the logging.configuration system property on the command line. The JBoss Server Migration Tool can migrate any module installed in the source server as long as that module is not already installed on the target server. Module migration can be done explicitly by request, or implicitly because another module or migrated server configuration depends on it. You can control whether a module should be migrated or not by using the modules.includes and modules.excludes environment properties. The syntax for a module ID is name:slot. The :slot is optional and if it is not specified defaults to main. A module whose ID is referenced by the modules.excludes environment property is never migrated. A module whose ID is referenced by the modules.includes environment property is always migrated, unless it is referenced by the modules.excludes environment property. You can configure the properties in the tool’s EAP_HOME/migration/configuration/environment.properties file. You can include the above properties in your own custom properties file, and then pass the properties file name on the command line using the --environment argument. $ EAP_HOME/bin/jboss-server-migration.sh --source EAP_PREVIOUS_HOME -Djboss.server.migration.modules.includes="com.example.moduleA" -Djboss.server.migration.modules.excludes="com.example.moduleC,com.example.moduleD"
The JBoss Server Migration Tool does not verify that the source module is compatible with the target server. An incompatible migrated module can cause the target server to malfunction or not work at all. A module can be incompatible due to a dependency on a module that is installed on both the source and target servers, but includes or exposes different resources on each one. You can customize the generation of the Task Summary using the following environment property. Include migrated subtasks in the summary where the level is less than or equal to the specified integer. You can customize the HTML report using the following environment properties. The name of the HTML report file. If not set, the report is not generated. The HTML report template file name. You can customize the XML report using the following environment properties. The name of the XML report file. If not set, the report is not generated. You can configure the JBoss Server Migration Tool to skip the migration of a standalone server entirely, to provide the configuration file names that you want to migrate, or to provide alternate paths for the source or target server’s base and configuration directories. You can customize the migration of the standalone server configuration using the following environment properties. If set to true, the tool skips the entire standalone server migration. Defines an alternative path for the source server’s standalone directory, which defaults to the source server’s EAP_HOME/standalone/ directory. Defines an alternative path for the source server’s standalone configuration directory, which defaults to the source server’s EAP_HOME/standalone/configuration/ directory. A comma-delimited list of the source server’s standalone configurations to be migrated. Defines an alternative path for the target server’s standalone directory, which defaults to the target server’s EAP_HOME/standalone/ directory. Defines an alternative path for the target server’s standalone configuration directory, which defaults to the target server’s EAP_HOME/standalone/configuration/ directory. For information about how to configure the JBoss Server Migration Tool using these properties, see Configuring the JBoss Server Migration Tool. You can configure the JBoss Server Migration Tool to skip the migration of a managed domain entirely, to provide the configuration file names that you want to migrate, or to provide alternate paths for the source or target server’s base and configuration directories. You can customize the migration of the managed domain configuration using the following environment properties. If set to true, the tool skips the entire managed domain migration. Defines an alternative path for the source server’s managed domain directory, which defaults to the source server’s EAP_HOME/domain/ directory. Defines an alternative path for the source server’s managed domain configuration directory, which defaults to the source server’s EAP_HOME/domain/configuration/ directory. A comma-delimited list of the source server’s managed domain configuration files that are to be migrated. A comma-delimited list of the source server’s host configuration files that are to be migrated. Defines an alternative path for the target server’s managed domain directory, which defaults to the target server’s EAP_HOME/domain/ directory. Defines an alternative path for the target server’s managed domain configuration directory, which defaults to the target server’s EAP_HOME/domain/configuration/ directory. By default, the JBoss Server Migration Tool automatically migrates all components and subsystems for each standalone server, managed domain, and host configuration you choose to migrate. You can customize the execution of specific tasks and subtasks performed by the tool using environment properties. For example, you can configure the tool to skip the removal of unsupported subsystems or to skip the migration of deployments. The tasks performed by the tool are dependent upon the type of server configuration and the version of the source server from which you are migrating. Information about how to configure environment properties to customize the tasks performed by the JBoss Server Migration Tool can be found in the following sections. By default, the JBoss Server Migration Tool performs the following tasks when migrating a standalone server configuration from JBoss EAP 6.4 to JBoss EAP 7.1. Set up HTTP Upgrade management. Set up the private interface. Add socket binding port expressions. Add the default SSL server identity to the ApplicationRealm. The JBoss Server Migration Tool removes all unsupported subsystem configurations and extensions from migrated server configurations. The tool logs each subsystem and extension to its log file and to the console as it is removed. To skip removal of the unsupported subsystems, set the subsystems.remove-unsupported-subsystems.skip environment property to true. A configuration that is migrated from a source server to a target server might reference or depend on a module that is not installed on the target server. 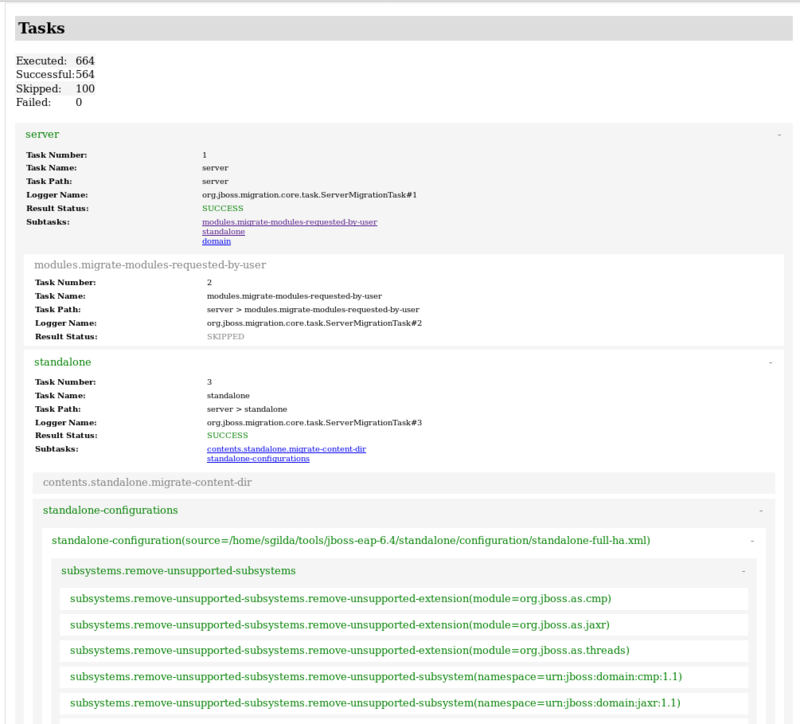 The JBoss Server Migration Tool detects this and automatically migrates the referenced modules, plus their dependent modules, from the source server to the target server. A module referenced by a standalone server configuration is migrated using the following process. A module referenced by a security realm configuration is migrated as a plug-in module. A module referenced by the datasource subsystem configuration is migrated as a datasource driver module. A module referenced by the ee subsystem configuration is migrated as a global module. A module referenced by the naming subsystem configuration is migrated as an object factory module. A module referenced by the messaging subsystem configuration is migrated as a JMS bridge module. A module referenced by a vault configuration is migrated to the new configuration. The console logs a message noting the module ID for any module that is migrated. It is possible to exclude the migration of specific modules by specifying the module ID in the modules.excludes environment property. See Configuring the Migration of Modules for more information. A configuration that is migrated from a source server to a target server might reference or depend on file paths and directories that must also be migrated to the target server. The JBoss Server Migration Tool does not migrate absolute path references. It only migrates files or directories that are configured as relative to the source configuration. The console logs a message noting each path that is migrated. Vault keystore and encrypted file’s directory. To skip the migration of referenced paths, set the paths.migrate-paths-requested-by-configuration.vault.skip environment property to true. The JBoss Server Migration Tool updates the transactions subsystem with the configuration changes required by the JBoss EAP 7.1 server. The JBoss Server Migration Tool removes the path and relative-to attributes from the transactions subsystem and replaces them with the equivalent object-store-path and object-store-relative-to attributes. To skip the automatic update of the transactions subsystem configuration, set the subsystem.transactions.update-xml-object-store-paths.skip environment property to true. The jacorb subsystem is deprecated in JBoss EAP 7 and is replaced by the iiop-openjdk subsystem. By default, the JBoss Server Migration Tool automatically migrates the jacorb subsystem configuration to its replacement iiop-openjdk subsystem configuration and logs the results to its log file and to the console. To skip the automatic migration to the iiop-openjdk subsystem configuration, set the subsystem.jacorb.migrate.skip environment property value to true. The web subsystem is deprecated in JBoss EAP 7 and is replaced by the undertow subsystem. By default, the JBoss Server Migration Tool automatically migrates the web subsystem configuration to its replacement undertow subsystem configuration and logs the results to its log file and to the console. To skip automatic migration of the web subsystem, set the subsystem.web.migrate.skip environment property value to true. The messaging subsystem is deprecated in JBoss EAP 7 and is replaced by the messaging-activemq subsystem. The JBoss Server Migration Tool automatically migrates the messaging subsystem configuration to its replacement messaging-activemq subsystem configuration and logs the results to its log file and to the console. To skip automatic migration of the messaging subsystem, set the subsystem.messaging.migrate.skip environment property value to true. The JBoss Server Migration Tool updates the infinispan subsystem configuration to better align with the new default JBoss EAP 7.1 configurations. It adds the EJB cache container, which is present in the JBoss EAP 7.1 default configuration, to configurations where it is not already included. It adds the server cache container, which is present in the JBoss EAP 7.1 default configuration. It updates the module name in the Hibernate cache container configuration. The JBoss Server Migration Tool automatically updates the infinispan subsystem configuration and logs the results to its log file and to the console. You can customize the update of the infinispan system by setting the following environment properties. If set to true, skip the update of the infinispan subsystem. If set to true, do not add the EJB cache container. If set to true, do not add the server cache container. If set to true, do not update the module name in the Hibernate cache container configuration. The JBoss Server Migration Tool updates the ee subsystem to configure the new Java EE 7 features supported in JBoss EAP 7.1. It configures instances of Java EE 7 concurrency utilities, such as container-managed executors, that are present in the JBoss EAP 7.1 default configuration and logs the results to its log file and to the console. It defines the Java EE 7 default resources, such as the default datasource, that are present in default JBoss EAP 6.4 configuration. If the resources are not found, the tool lists all available resources in the configuration, and then provides a prompt to select a resource from the list or to provide the JNDI address of the resource that should be set as the default. JNDI names that are specified are assumed to be valid. JNDI names are not validated by the tool. The JBoss Server Migration Tool automatically updates the ee subsystem configuration and logs the results to its log file and to the console. You can customize the update of the ee system by setting the following environment properties. If set to true, skip the update of the ee subsystem. If set to true, do not add the default instances of concurrency utilities. If set to true, do not set up Java EE 7 default resources. Specifies the name of the default datasource to look for in the source configuration. Specifies the JNDI name for the default datasource. Specifies the name of the default JMS connection factory. Specifies the JNDI name for the default JMS connection factory. If you choose to configure the Java EE 7 concurrency utilities, then the tool automatically configures the instances that are present in the default JBoss EAP 7.1 configurations and logs the results to its log file and to the console. INFO  [ServerMigrationTask#49] Default ContextService added to EE subsystem configuration. INFO  [ServerMigrationTask#49] Default ManagedThreadFactory added to EE subsystem configuration. INFO  [ServerMigrationTask#49] Default ManagedExecutorService added to EE subsystem configuration. INFO  [ServerMigrationTask#49] Default ManagedScheduledExecutorService added to EE subsystem configuration. When defining the Java EE 7 default resources the tool automatically selects those that are present in the default JBoss EAP 7.1 configuration. INFO  [ServerMigrationTask#50] Java EE Default Datasource configured with JNDI name java:jboss/datasources/ExampleDS. If no default resource is found, the tool lists all resources that are available in the configuration, and then provides a prompt to select the default resource or to provide the JNDI address of the resource that should be set as the default. The following is an example of the interaction that occurs when migrating a configuration file with an ExampleDS datasource. INFO  [ServerMigrationTask#22] Default datasource not found. INFO  [ServerMigrationTask#22] Java EE Default Datasource configured with JNDI name java:jboss/datasources/ExampleDS. Save this Java EE Default Datasource JNDI name and use it when migrating other config files? If you run the JBoss Server Migration Tool in non-interactive mode and the expected JBoss EAP 6.4 default resources, such as the default JMS connection factory, are not available, the tool does not configure those resources. The JBoss Server Migration Tool makes the following updates to the ejb3 subsystem to better align with the new default JBoss EAP 7.1 configurations. It updates the remote service configuration to reference the new HTTP connector. It configures the default-sfsb-passivation-disabled-cache attribute to use the default-sfsb-cache. It replaces the legacy passivation store and cache configurations with the JBoss EAP 7.1 default values. The JBoss Server Migration Tool automatically updates the ejb3 subsystem configuration and logs the results to its log file and to the console. You can customize the update of the ejb3 system by setting the following environment properties. If set to true, skip the update of the ejb3 subsystem. If set to true, do not replace the passivation-store and cache configurations. If set to true, do not update the default-sfsb-passivation-disabled-cache configuration. If set to true, do not update the EJB remoting configuration. The JBoss Server Migration Tool updates the jgroups subsystem to align with the new JBoss EAP 7.1 configurations. It replaces the MERGE2 protocol with MERGE3. It replaces the FD protocol with FD_ALL. It replaces the pbcast.NAKACK protocol with pbcast.NAKACK2. It replaces the UNICAST2 protocol with UNICAST3. It removes the RSVP protocol. To skip the automatic migration of the jgroups subsystem, set the subsystem.jgroups.update.skip environment property to true. JBoss EAP 7 introduces a new HTTP connector that replaces all legacy remoting protocols and ports using a single port. The JBoss Server Migration Tool automatically updates the remoting subsystem to use the new HTTP connector. To skip the automatic update of the remoting subsystem configuration, set the subsystem.remoting.update.skip environment property to true. In addition to migrating the web subsystem for JBoss EAP 7.1, the JBoss Server Migration Tool updates its replacement undertow subsystem to add the new features it supports. It sets the default HTTP listener redirect socket. It adds support for Java EE 7 WebSockets. It sets the default HTTPS listener. It adds support for HTTP2. It sets the default Server response header. It sets the default X-Powered-By response header. It sets the default HTTP Invoker. The JBoss Server Migration Tool automatically updates the undertow subsystem configuration and logs the results to its log file and to the console. You can customize the update of the undertow system by setting the following environment properties. If set to true, skip the update of the undertow subsystem. If set to true, do not set the default HTTP listener redirect socket. If set to true, do not add support for WebSockets. If set to true, do not set the default HTTPS listener. If set to true, do not add support for HTTP2. If set to true, do not set the default Server response header. If set to true, do not set the default X-Powered-By response header. If set to true, do not set the default HTTP Invoker. In addition to migrating the messaging subsystem for JBoss EAP 7.1, the JBoss Server Migration Tool updates its replacement messaging-activemq subsystem to add the new features it supports. It adds the default HTTP connector and acceptor to enable the new HTTP-based remote messaging clients. The JBoss Server Migration Tool automatically updates the messaging-activemq subsystem configuration and logs the results to its log file and to the console. To skip the automatic update of the messaging-activemq subsystem, set the subsystem.messaging-activemq.update.skip environment property to true. The JBoss EAP 7.1 batch-jberet subsystem provides support for JSR 352: Batch Applications for the Java Platform. The JBoss Server Migration Tool automatically adds the default batch-jberet subsystem configuration to the migrated configuration file. To skip the addition of the batch-jberet subsystem configuration, set the subsystem.batch-jberet.add.skip environment property to true. The JBoss EAP 7.1 core-management subsystem provides management-related resources, which were previously configured in the management core service. Examples of these resources include the ability to view a history of configuration changes made to the server and the ability to monitor for server lifecycle events. The JBoss Server Migration Tool automatically adds the default core-management subsystem configuration to the migrated configuration file. To skip the addition of the core-management subsystem configuration, set the subsystem.core-management.add.skip environment property to true. The JBoss EAP 7.1 elytron subsystem provides a single unified security framework that can manage and configure access for both standalone servers and managed domains. It can also be used to configure security access for applications deployed to JBoss EAP servers. The JBoss Server Migration Tool automatically adds the default elytron subsystem configuration to the migrated configuration file. To skip the addition of the elytron subsystem configuration, set the subsystem.elytron.add.skip environment property to true. The JBoss EAP 7.1 request-controller subsystem provides congestion control and graceful shutdown functionality. The JBoss Server Migration Tool automatically adds the default request-controller subsystem configuration to the migrated configuration file. To skip the addition of the request-controller subsystem configuration, set the subsystem.request-controller.add.skip environment property to true. The JBoss EAP 7.1 security-manager subsystem provides support for Java EE 7 security permissions. The JBoss Server Migration Tool automatically adds the default security-manager subsystem configuration to the migrated configuration file. To skip the addition of the security-manager subsystem configuration, set the subsystem.security-manager.add.skip environment property to true. The JBoss EAP 7.1 singleton subsystem provides singleton functionality. The JBoss Server Migration Tool automatically adds the default singleton subsystem configuration to the migrated configuration file. To skip the addition of the singleton subsystem configuration, set the subsystem.singleton.add.skip environment property to true. The addition of Undertow in JBoss EAP 7 added HTTP Upgrade, which allows for multiple protocols to be multiplexed over a single port. This means a management client can make an initial connection over HTTP, but then send a request to upgrade that connection to another protocol. The JBoss Server Migration Tool automatically updates the configuration to support HTTP Upgrade management. To skip configuration of HTTP Upgrade management, set the management.setup-http-upgrade.skip environment property to true. The JBoss EAP 7 default configuration uses a new private interface on all jgroups socket bindings. The JBoss Server Migration Tool automatically updates the migrated jgroups socket bindings to use same configuration. To skip the configuration of the private interface, set the interface.private.setup.skip environment property to true. The JBoss Server Migration Tool automatically adds these value expressions to the migrated server configurations. To skip update of the socket binding port expressions, set the socket-bindings.add-port-expressions.skip environment property to true. Because the JBoss EAP 7.1 security realm configurations are fully compatible with the JBoss EAP 6.4 security realm configurations, they require no update by the JBoss Server Migration Tool. However, if the application-users.properties, application-roles.properties, mgmt-users.properties, and mgmt-groups.properties files are not referenced using an absolute path, the tool copies them to the path expected by the migrated configuration file. To skip the security realms migration, set the security-realms.migrate-properties.skip environment property to true. The JBoss EAP 7.1 default configuration includes an SSL server identity for the default ApplicationRealm security realm. The JBoss Server Migration Tool automatically adds this identity to the migrated configuration files. To skip the addition of this identity, set the security-realm.ApplicationRealm.add-ssl-server-identity.skip environment property to true. The JBoss Server Migration Tool can migrate the following types of standalone server deployment configurations. Deployments it references, also known as persistent deployments. Deployments found in directories monitored by its deployment scanners. The migration of a deployment consists of installing related file resources on the target server, and possibly updating the migrated configuration. The JBoss Server Migration Tool is preconfigured to skip deployments by default when running in non-interactive mode. To enable migration of deployments, set the deployments.migrate-deployments.skip environment property to false. Be aware that when you run the JBoss Server Migration Tool in interactive mode and enter invalid input, the resulting behavior depends on the value of the deployments.migrate-deployments environment property. If deployments.migrate-deployments.skip is set to false and you enter invalid input, the tool will try to migrate the deployments. If deployments.migrate-deployments.skip is set to true and you enter invalid input, the tool will skip the deployments migration. To enable the migration of specific types of deployments, see the following sections. The JBoss Server Migration Tool does not determine whether deployed resources are compatible with the target server. This means that applications or resources might not deploy, might not work as expected, or might not work at all. Also be aware that artifacts such as JBoss EAP 6.4 *-jms.xml configuration files are copied without modification and can cause the JBoss EAP server to boot with errors. Red Hat recommends that you use the Red Hat Application Migration Toolkit to analyze deployments to determine compatibility among different JBoss EAP servers. For more information, see the Red Hat Application Migration Toolkit product documentation. To enable migration of persistent deployments when running in non-interactive mode, set the deployments.migrate-persistent-deployments.skip environment property to false. The JBoss Server Migration Tool searches for any persistent deployment references and lists them to the console. The processing workflow then depends on whether you are running the tool in interactive mode or in non-interactive mode, as described below. If you run the tool in non-interactive mode, the tool uses the preconfigured properties to determine whether to migrate the persistent deployments. Persistent deployments are migrated only if both the deployments.migrate-deployments.skip and deployments.migrate-persistent-deployments.skip properties are set to false. If you run the tool in interactive mode, the JBoss Server Migration Tool prompts you for each deployment using the following workflow. After printing the persistent deployments it finds to the console, you see the following prompt. This tool is not able to assert if persistent deployments found are compatible with the target server, skip persistent deployments migration? Respond with yes to skip migration of persistent deployments. All deployment references are removed from the migrated configuration and you end this part of the migration process. Respond with no to continue with the migration. If you choose to continue, you see the following prompt. Migrate all persistent deployments found? Respond with yes to automatically migrate all deployments and end this part of the migration process. If you choose to continue, you receive a prompt asking to confirm the migration for each referenced deployment. Respond with yes to migrate the deployment. Respond with no to remove the deployment from the migrated configuration. Deployment scanners, which are only used in standalone server configurations, monitor a directory for new files and manage their deployment automatically or through special deployment marker files. To enable migration of deployments that are located in directories watched by a deployment scanner when running in non-interactive mode, set the deployments.migrate-deployment-scanner-deployments.skip environment property to false. When migrating a standalone server configuration, the JBoss Server Migration Tool first searches for any configured deployment scanners. For each scanner found, it searches its monitored directories for deployments marked as deployed and prints the results to the console. If you run the tool in non-interactive mode, the tool uses the preconfigured properties to determine whether to migrate the deployment scanner deployments. Deployment scanner deployments are migrated only if both the deployments.migrate-deployments.skip and deployments.migrate-deployment-scanner-deployments.skip properties are set to false. After printing the deployment scanner deployments it finds to the console, you see the following prompt. This tool is not able to assert if the scanner's deployments found are compatible with the target server, skip scanner's deployments migration? Respond with yes to skip migration of deployment scanner deployments. All deployment references are removed from the migrated configuration and you end this part of the migration process. Migrate all scanner's deployments found? INFO  [ServerMigrationTask#69] Resource with path EAP_HOME/standalone/deployments/helloworld02.war migrated. The migration of deployment overlays is a fully automated process. If you have enabled migration of deployments by setting the deployments.migrate-deployments.skip environment property to false, the JBoss Server Migration Tool searches for deployment overlays referenced in the standalone server configuration that are linked to migrated deployments. It automatically migrates those that are found, removes those that are not referenced, and logs the results to its log file and to the console. When you use the JBoss Server Migration Tool to migrate a domain controller to a new release of JBoss EAP, it can cause the hosts that connect to it, but still run on a previous release of the server, to fail to boot. For this reason, you should migrate your hosts before you migrate your domain controller. If you do not want to migrate your hosts, be sure to read the following information before you begin. Review Configure a JBoss EAP 7.x Domain Controller to Administer JBoss EAP 6 Instances in the Configuration Guide for JBoss EAP. Pay particular attention to the section entitled Prevent the JBoss EAP 6 Instances from Receiving JBoss EAP 7 Updates. For additional information, see Managing Multiple JBoss EAP Versions in the Configuration Guide for JBoss EAP. By default, the JBoss Server Migration Tool performs the following tasks when migrating a managed domain configuration from JBoss EAP 6.4 to JBoss EAP 7.1. Add socket binding multicast address expressions. Add the load balancer profile. Add the host excludes configuration. Remove the PermGen attributes from the JVM configurations. A module referenced by a managed domain configuration is migrated using the following process. The JBoss Server Migration Tool automatically updates the unsecure interface configuration to align with the JBoss EAP 7.1 default configuration. To skip configuration of the unsecure interface, set the interface.unsecure.update.skip environment property to true. The JBoss EAP 7.1 default configuration uses value expressions in the multicast-address attribute of mod_cluster socket bindings. The JBoss Server Migration Tool automatically adds these value expressions to the migrated configuration files. To skip the addition of these expressions, set the socket-bindings.multicast-address.add-expressions.skip environment property to true. The JBoss EAP 7.1 includes a new default profile specifically tailored for hosts that serve as load balancers. The JBoss Server Migration Tool automatically adds and configures this profile to all migrated managed domain configurations. To skip the addition of this profile, set the profile.load-balancer.add.skip environment property to true. The JBoss EAP 7.1 domain controller can potentially include functionality that is not supported by hosts running on older versions of the server. The host-exclude configuration specifies the resources that should be hidden from those older versions. When migrating a domain controller configuration, the JBoss Server Migration Tool adds to or replaces the source server’s host-exclude configuration with the configuration of the target JBoss EAP 7.1 server. The JBoss Server Migration Tool automatically updates the host-exclude configuration and logs the results to its log file and to the console. The usage of PermGen attributes in JVM configurations is deprecated in JBoss EAP 7. The JBoss Server Migration Tool automatically removes them from all JVM configurations for all server groups. To skip removal of the PermGen attributes, set the jvms.remove-permgen-attributes.skip environment property value to true. The JBoss Server Migration Tool can migrate the following types of managed domain deployment configurations. By default, the JBoss Server Migration Tool performs the following tasks when migrating a host server configuration from JBoss EAP 6.4 to JBoss EAP 7.1. A module referenced by a host server configuration is migrated using the following process. The JBoss EAP 7 jmx subsystem provides the ability to manage and monitor systems. The JBoss Server Migration Tool automatically adds this subsystem to the migrated configuration file. To skip the addition of the jmx subsystem configuration, set the subsystem.jmx.add.skip environment property to true. The JBoss Server Migration Tool automatically removes the unsecure interface configuration to align with the JBoss EAP 7.1 default configuration. To skip removal of the unsecure interface, set the interface.unsecure.remove.skip environment property to true. By default, the JBoss Server Migration Tool performs the following tasks when migrating a standalone server configuration from JBoss EAP 7.0 to JBoss EAP 7.1. Any subsystem that was not supported in JBoss EAP 7.0, but was added by an administrator to that server, is also not supported in JBoss EAP 7.1 and will be removed. Because the JBoss EAP 7.1 security realm configurations are fully compatible with the JBoss EAP 7.0 security realm configurations, they require no update by the JBoss Server Migration Tool. However, if the application-users.properties, application-roles.properties, mgmt-users.properties, and mgmt-groups.properties files are not referenced using an absolute path, the tool copies them to the path expected by the migrated configuration file. Review Configure a JBoss EAP 7.1 Domain Controller to Administer JBoss EAP 7.0 Instances in the Configuration Guide for JBoss EAP. Pay particular attention to the section entitled Prevent the JBoss EAP 7.0 Instances from Receiving JBoss EAP 7.1 Updates. By default, the JBoss Server Migration Tool performs the following tasks when migrating a managed domain configuration from JBoss EAP 7.0 to JBoss EAP 7.1. By default, the JBoss Server Migration Tool performs the following tasks when migrating a host server configuration from JBoss EAP 7.0 to JBoss EAP 7.1. The following is an example of the Task Summary report. The following is an example of the JBoss Server Migration HTML report. The following is an example of the JBoss Server Migration XML report.